I’m on an emotional roller coaster and I couldn’t get off even if I tried. I’m up, I’m down; I’m sure of myself, and I’m wondering what the hell I was thinking. 14 days to departure. T minus two weeks and counting. Holy sh…..
I’m scared out of my mind. Of what, I couldn’t tell you, but that’s probably contributing to my fear. I don’t know what’s in store for me when I get to Jamaica. I don’t know who I’m going to meet, or what my living conditions will be like. An idea, sure, but every situation is circumstantial. I’m nervous about not doing well. I spent a lot of time thinking, how hard could it possibly be, despite how many times I’ve read or heard about the “hardships” a PCV faces. Now, in the wake of my sudden apprehension, I worry I was being too cocky. I go from feeling on top of the world about it, to having a feeling at the pit of my stomach like I’m making a terrible mistake. I walk around with confidence, proud of myself and this accomplishment, and then I hug a friend goodbye and I feel the ground crumbling beneath my feet. In the span of a moment, I could easily begin with “I got this sh**.” to “Oh my god what the hell is wrong with me?” My perception and my feelings are constantly changing. I keep finding new things to be excited about, and new things I’m terrified to be leaving behind. Let me say this now, so you don’t misunderstand: I’M NOT GIVING THIS UP. In October 2011, I bit the bullet and submitted an application. I didn’t think I’d get in. I was convinced I wasn’t good enough to be accepted into such a prestigious group. And now it’s 14 days to departure. I can do this. I know I can. I’ve taught myself that I can do anything I put my mind to. I wanted this, and so I went out and got it. Later tonight, ask me how I feel, and I bet you’ll get a different answer. Today, my time is devoted to seeing my family. We’ve got a great day/evening planned, and at its close, I’ll kiss everyone goodbye and I wont be seeing them again for another two years. Two years without my family? I signed up for that? This was that I wanted? Please, remind me again, why? See? Up and down. I’ve got this sh**, but really, what am I doing? I’ve been trying for a month to write a halfway decent blog post. I’m four weeks prior to departure, you see, and in theory, I should have something heartfelt and sincere to say. Perhaps a few final thoughts I care to leave behind? A legacy? A farewell? I have very little that I care to say out loud. I, alone, am privy to my thoughts, as they are rapidly changing and I can’t seem to keep up. I’m nervous. I’m scared. Excited and thrilled. In many ways, this is everything I’ve always wanted. And in many others, it’s nothing I ever expected. Last weekend, I ventured into the Northeast to visit my friends from college. It was a much-needed break that allowed me a chance to unwind and decompress. Next weekend, I’ll be able to do it again, but this time, in the company of a friend with whom I share a complicatedly simple relationship. When I return, it’s go time. I have shopping lists and to-do lists that are miles long and will have less than three weeks to get everything done. There will hardly be time to think, and before I know it, it will be March 11th. My world will likely be flipped upside down in ways that I never saw coming. I’ll say goodbye to my home, my friends, and my family. I’ll give up the creature comforts that I knowingly take for granted. I’ll bid farewell to a community for whom my appreciation came unexpectedly. My students will likely forget my name. And I fear that my beloved pet… My Emma. My girl. She’s getting old and… oh god I don’t even want to think it. …Because I wanted this. I wanted the uncertainty. I wanted the fear. I wanted the unknown. Eighteen months ago, I decided I was ready to give up what I know in exchange for the adventure of a lifetime. The world is mine and my future belongs to me. The Peace Corps will test me, push me to my limits, and force me to rise above. I will grow and I will change. I will not be the same person I was when I started, but I look forward to meeting her in the end. Something is stirring within me. It’s an awakening, a new awareness. I believe this is what they call a transitioning period. Gone are the days of long waits in agonizing silence. No longer do I sit and wonder if I’ll get in. Now I have a destination. I have answers to questions that I’ve asked for a year. I also have a new perception. Nostalgia creeps around every corner, catching me off guard each time. You see, I’ve spent so long considering the hardships of joining a new community, that I failed to recognize the one I am leaving behind. My love and appreciation for the Temple Beth Am community came unexpectedly. Growing up, I never considered myself a religious person. Even at a young age, I understood that my being there, trying to fit in with a community whose faith I constantly questioned, was disrespectful. But I never voiced my thoughts, and I remained a part of the community at my family’s behest. I attended temple services on High Holy Days and discovered that I liked running into people I knew. Whether it be old classmates from my elementary days or friends of the family, I used the opportunity to keep up with the latest in their lives. Upon my return home from college, I was offered a job, but I politely declined. A few months later, they tried again. I couldn’t understand why they’d ask me to teach for a program that, as a student, I did everything in my power to get out of. The position was only for one night a week, but I needed the money and I wanted the experience. So I said okay. Three school seasons later, and I am proud to still be a part of that team. My name was eventually added to the Day School substitute list, and I found myself spending a great amount of time there. I’d gone from student to teacher, and I’d never felt more accomplished. I was now working alongside the professionals that first educated me. This past summer, while I nervously waited to hear from Peace Corps, I worked as a lifeguard for TBA’s summer camp program for nursery age children. It was then, as I watched parents drop off their little ones, that I finally felt a sense of belonging. I joined the Beth Am community when I was five years old, but my involvement extends even before my birth. My parents were married there, in the very same synagogue where I became a Bat Mitzvah. Over the course of twenty years, I’ve watched the school grow and change. I’ve forged lasting friendships with the other teachers, many of whom I had as a child. Even in the past three years, I’ve experienced the joyous sensation of watching the students grow. I now finally understand why my departure is so bittersweet. They say it takes a village to raise a child. I see now how that is true. Temple Beth Am was my village, and with them, I grew from child to adult. I embraced the traditions set by those before me, and took to heart many of the lesson’s I’d been taught. Though I was reluctant, I’m glad now that I never backed out. At the risk of sounding cliché, Beth Am will always hold a special place in my heart. So much of my life has been spent there; milestone after milestone was achieved within those walls. With the guiding hands of my teachers, I unlocked passions that have taken me to soaring heights. I could never give in return as much as Beth Am has given to me. From providing me with a solid foundation, to offering me my first real teaching job, Beth Am has become to feel like a second home. And for as long as I live, I’ll never relinquish the sense of belonging I have now come to own. Upon invitation to serve, every volunteer is asked write an Aspiration Statement, which will be given to his or her host country as way to introduce him or herself before arriving on site. During my Peace Corps service, I plan to use the teaching skills I’ve acquired in the last two years since graduating from college. Organization, time management, and leadership have always been strong suits of mine, and I intend to continue strengthening them during my Peace Corps service. More importantly however is my ability to set realistic goals and plan the appropriate steps to achieve them. I am a dedicated individual who thrives off of hard work. I am also a good listener. I am capable of comprehending the needs of others, either because they’ve been voiced to me, or because I’ve observed them. Seeing situations from another person’s perspective has always come naturally to me. I hope to use these skills to become a part of the community, and to determine what is asked of me during my commitment to serve. I believe in the work that I am doing, and I believe in the good I am achieving. It has always been my dream to make a difference in the world, and my service in the Peace Corps allows me to do just that. My first strategy in working effectively with my host country is to adapt to religious changes. I was raised in a Jewish community, and I possess a rich Jewish education, however I do not consider myself a religious person. I believe that everyone has a right to his or her own faith, and I am accepting of any religion. I plan to take part in the activities put on by the church, as well as attend services should it be requested of me. My second strategy will be to keep my heart open. As I said before, I believe in the work that I am doing and the good that I am achieving. I want to learn as much from the community as I plan to teach and share with them, and the only way to find that perfect balance is to recognize the power of love. By keeping yourself open, you exhibit acceptance, understanding, and compassion. I am certain that I will receive from my host community as much love as I bestow upon them. In adapting to a new a culture, one thing to bear in mind is that my cultural norms are not likely to be the same as their cultural norms. Part of my strategy for adapting to Jamaica’s culture is participating in church-related activities, or activities hosted by the church. I would willingly and happily attend services, should it be asked of me, and I have no quarrels about practicing religious traditions as a member of my new community. I also plan on asking a lot of questions. I’ve always learned best through dialogue, so I intend to engage my fellow Jamaicans so that I may get to know him or her, the culture, and the ways of the land. I am excited to have an opportunity to live, work, and experience life the way Jamaicans do. Lastly, I intend to write. My writing is as important to me as it is to breathe. I see the potential for a story everywhere I go, and in everyone that I meet. I experience life through seeing the bigger picture, and that makes me appreciate it all the more. I commit my writing to memory; I know that the friendships I will make and the lives that I will touch during my Peace Corps service will never be forgotten. I am as eager to learn a new language as I am to teach one. I hope that by accumulating a new vocabulary, I can draw comparisons that will help me develop lesson plans. I understand that Patois is a spoken dialect and that I am responsible for introducing the English language to my students. I hope to learn about the family dynamics in Jamaica, and the strength that education plays in the community. This knowledge will allow me to be more successful in my endeavor to build parent-teacher relationships. During my PST I would like to develop the skills necessary to work alongside Jamaican educators in my community. I believe that learning these skills and lessons will help me play a more beneficial role in the education system. I can’t be certain of exactly what I’d like to do when my Peace Corps service ends, but I know that it will be a career involving children. I’ve always had a love for being a role model and sharing my knowledge and experience. Children are our future, and it is rewarding to know that I can play a hand in their development. I can see myself teaching in a classroom, but I can also see myself teaching in different capacities. My passion for horseback riding presents one alternative career path. My adoration for summer sleep-away camps presents another. I have aspirations of becoming a summer camp director of my own program in years to come. The skills that I will acquire during my Peace Corps service will provide me with the ability to create my own program, or strengthen an existing one. Summer camps are like foreign communities in their own regard, because they have traditions and customs that are unique to each individual establishment. Learning how to play a vital role in the community would be of great benefit in preparing me for my own camp program. When I started this process, I didn’t think I’d get in. “There’s no way,” I told a friend. “I’m not qualified enough.” There was nothing he or anyone else could have said that would persuade me otherwise. 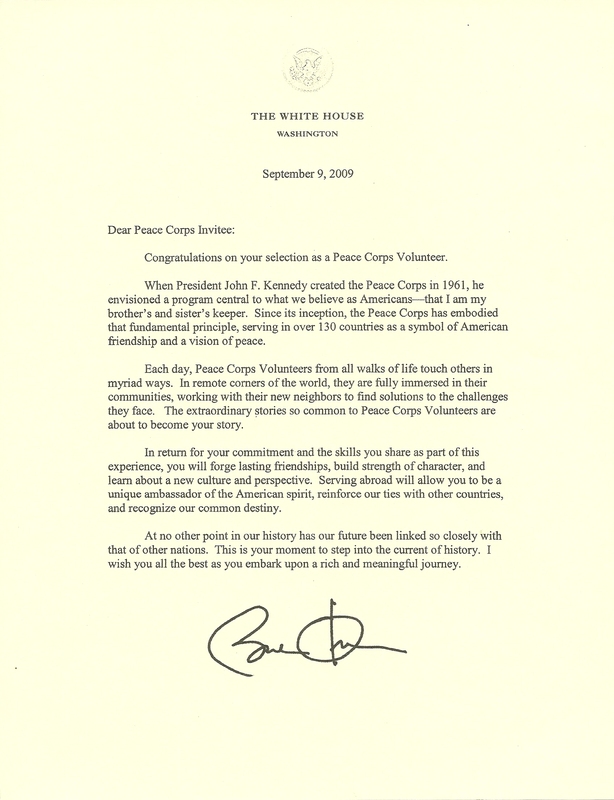 The Peace Corps was a longshot; a pipe dream, and I was not about to get my hopes up. But as I started compiling my experience and my references I began to feel that maybe, just maybe, I stood a chance. Here I am, one full year later, after a tedious and nerve wracking application process, bound for Jamaica. I am humbled, shocked, excited and scared. It’s still sinking in that I’m getting this opportunity. I’m still in disbelief that I made it this far. My expectations have never been higher, but as consequence, if I fall, I never would have fallen further. So why am I not bragging about my accomplishment? I’m proud of myself; this is a dream come true. And since I know there are a great number of people who would be thrilled for me, what reasons do I have to hold my tongue? I’m afraid to talk about it because I still worry it will all fall through. Like so many of the opportunities in my past that slipped through my fingers I can’t shake the fear that I’ll lose this one too. It isn’t over; I’m still afraid I’ll jinx it. More pressing however is the fear that I’ll reveal too much. I’m incredibly disappointed I’m being kept so close. I was willing and eager to go anywhere in the world, medically fit to serve in any location, and excited about the idea of living without even the basic amenities like electricity or indoor plumbing. I suppose it was just too convenient to send me three hours south of where I grew up. I wanted an adventure, and instead it feels like I am camping in my backyard. I anticipated hours of travel to help me disconnect. I wanted the distance. Adventures, you see, don’t happen close to home. But before I discredit my entire volunteer experience without having first given it a chance, allow me to spend some time talking about what I am happy about. The job. Everything about my job description is right up my alley. I’ll be teaching kids to read and write English. Instead of a classroom of little African students, I’ll have a classroom of Jamaican students, which in all honesty is just as exciting. I’ll also be working with children who require Special Education, as well as developing youth groups. This is everything that I’ve spent my life preparing for. Who ever would have thought that 10 years of summer sleep-away camp and a couple of other odd jobs with kids would make me the most promising candidate for the position? I certainly did not. I’m excited about learning Patois. When I was taking Hebrew in college, it felt so cool to slip into the language. It helped transform my identity. Suddenly, I felt like two different people! I used to change it up mid-conversation just to see who was paying attention. Having those skills with me while I was in Israel only helped to enhance my experience. Plus, it’s cool as hell. How many people do you know that speak Patois? Regardless of location, I’m psyched that I’m going anywhere at all. I have the rare opportunity to immerse myself in a different way of life. I think there’s something beautiful about leaving your comfort zone and trying something new. I can’t wait to shed my American culture, wrapped up in tragic excuses for entertainment, politicians who are trying to rule the world, and people who can’t put down their phones long enough to share a meal. I’ll miss sleeping in some mornings, but I’ve been dying to rise with the sun and really make the most of my day. Most importantly however, I know that I am doing something worthwhile. I can’t stand this monotonous system we’re living in. We’ve become so blinded in our advancement as a species (and our culture) that we’ve forgotten the basic principles. People are people. We breathe the same air. We all have feelings, and we all have friends and family. We also need to remember that we’re not so different from animals. Intelligence is the only thing that significantly sets us apart. How different the world would be if everyone understood that and gave just a little bit more of themselves… At least this way I can feel like I am doing my part. Without veering too far off topic, let’s come back to this adventure business. Here’s what we know: Adventures require uncertainty. They require unfamiliarity. They require an openness to explore, both your surroundings and yourself. They will draw your strengths from within you and their very nature will test your faith. An adventure will put you through hell, and then reward you with riches. We also know that you cannot choose your adventure. You’ll have the one you were meant to have. Expected or unexpected, we know that you’ll grow from it. Now consider Jamaica. It’s not exactly where I had in mind, and there isn’t a whole lot of “adjusting” that needs to be done. (I will have electricity, after all.) But, I was selected for Jamaica because that’s where I needed to be. I’m not sure what fate has in store for me (remember, adventures happen for a reason), but whatever it is, I need to be in Jamaica in order for it to happen. And while we are drawing comparisons, I didn’t get to choose this adventure either. I might not get to go to Africa, but I do get to go to Jamaica. And that is just as much of an adventure. It’s a new land. It’s uncharted territory. It’s a place I’ve never been. I have absolutely no idea what’s in store for me, but I do know that I will face challenges, and I know I will overcome them. At the close of this journey, I know I will have grown from it. The lessons I’ll learn will change me forever. Maybe keeping me so close to home is how I’ll be tested. Destiny is throwing me a curveball and it wants to see how I handle it. In any case, Jamaica can still be the adventure I crave. I just need not to get hung up on the fine details. What’s important is that I’m doing something that’s right. I’m doing something that’s good. The 27 months that I’ll spend overseas will be the most rewarding experience I’d ever hope to have. I am confident that this is where I need to be. I am confident this what I was meant to do. This is my calling. Ladies and Gentlemen, I have joined the Peace Corps. Read my Aspiration Statement, if you haven’t already.